With two decades in the business under their belt, Draggin Jeans are the number one casual motorcycle clothing brand in the world. Using pioneering methods to combine the worlds strongest fibres in order to create a lightweight inner lining that isn’t just comfortable but literally saves your skin. This level of detail is what has made Draggin Jeans the only casual clothing brand to pass CE Abrasion, Burst and Tear tests across their huge current range of motorcycle Kevlar jeans and hoodies. The Roo Hoody has been Draggin’s most successful product ever launched in the Australian market and now it is available to UK bikers too. 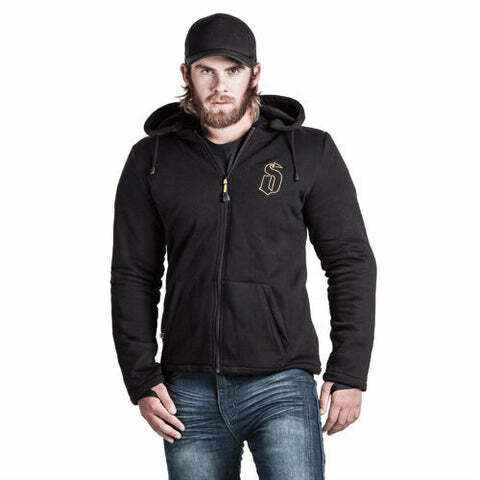 With a huge list of features that help make this a super protective but casual hoodie. Draggin have utilised their unique Roomoto lining which uses DuPont Kevlar and Dyneema materials, alongside the CE protectors in the back, shoulders, and elbows to make this a very cool summer/spring replacement for your heavy jacket, or simply something to wear over a base layer. Ergonomically, the Roo Hoody is a great piece of kit thanks to the thumbhole inside the wrist cuff to keep your gloves underneath, deep inner pockets for storage, and waist toggles to keep the hoodie in position while you ride. A protective jacket that's casual enough to wear around town, but durable enough to ride the streets! [lightbox url="https://cdn.shopify.com/s/files/1/0551/6185/files/Screen_Shot_2017-03-20_at_11-min.png?151095567513188846" text="View Draggin Jeans Size Chart" class="btn btn-info"
These Classic design semi boot cut jeans from Draggin are a stylish alternative to full riding gear for hotter days or when you need to park up and walk around town but want to do it in comfort. Featuring the Kevlar DuPont & Dyneema material that Draggin are well known for. Available in a range of leg lengths, check size chart below and select from drop down menu above. 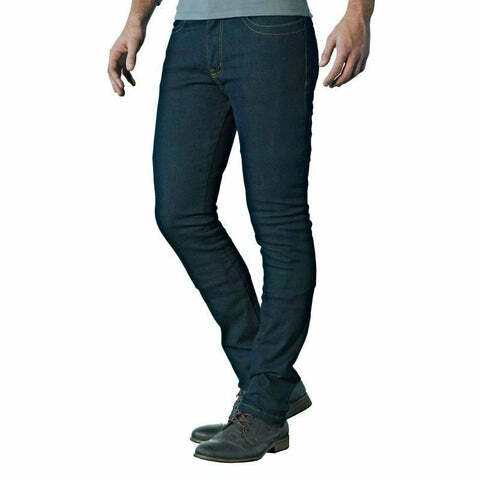 [lightbox url="https://cdn.shopify.com/s/files/1/0551/6185/files/draggin_size_chart-min.png?18287644133496481553" text="View Draggin Jeans Size Chart" class="btn btn-info"
The Drift Jeans from the Draggin Drayko collection are a modern styled kevlar jean that not only save your skin but also make riding more comfortable and casual. Dark denim outer material is distressed like a normal street jean to make them stylish enough to wear on and off the bike. A loose leg means they are comfortable when your legs are bent up on the bike and allows them to pull over any riding boots. Knee armour pockets are stitched in to provide somewhere to put any armour of your choice adding even more protection. Razzo is a kevlar jean that combines safety, style and value for the rider who want something more casual to wear on the bike and walk around in when you reach your destination. A semi boot cut and loose leg fit makes them fit comfortably over riding boots and prevents and restricted movement while you ride. 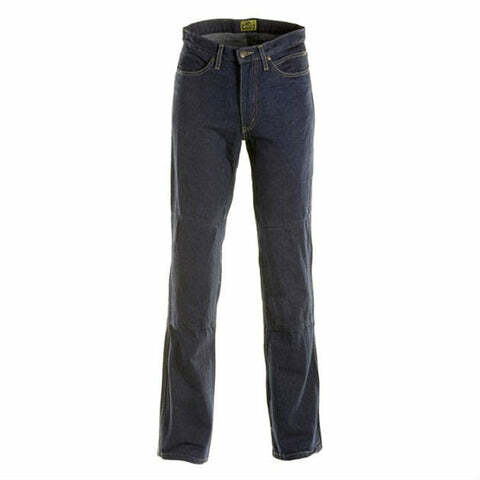 The Traffik jeans from Drayko are the perfect solution for any street biker on a budget who is after some casual trousers that protect you and skin as well as they look. 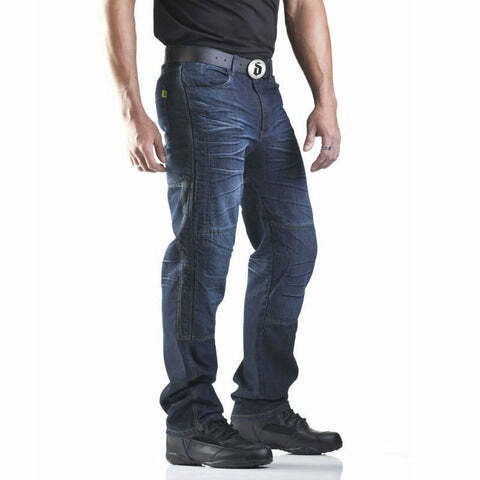 Stretchy denim is used to make the jeans feel comfortable even while your legs are bent on the bike, while the exclusive RooMoto kevlar liner saves your skin from touching the tarmac in a slide making them an effective all rounder. The Holeshot kevlar jeans from Draggin are the premium trousers from their range, featuring a full RooMoto lining that is exclusive to this model and holds the best abrasive resistance of any other Draggin jeans. An internal sports lining keeps your legs cool and free from sweat while you ride and even while your not riding making them perfect for just walking around town and looking casual. Hip & Knee armour pockets are stitched in to provide somewhere to put any armour of your choice adding even more protection. 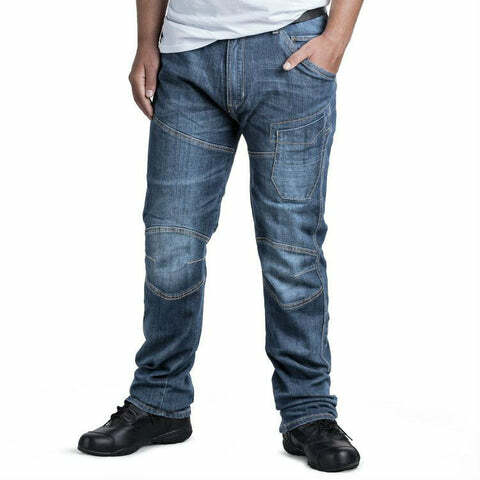 A straight leg protective jean that not only saves your skin in a crash or slide, but lets you get off the bike and walk around town looking as casual as you would in fashion jeans. 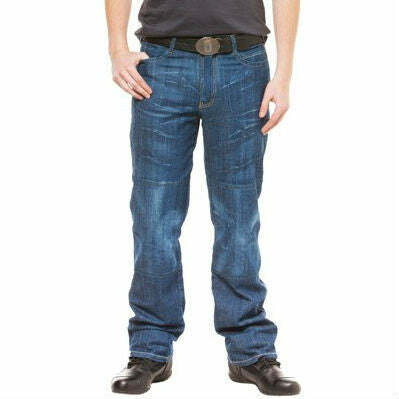 As with all Draggin jeans, the Next Gen are built with a high level of safety and are ready to be fitted with hip and knee armour plus are lined with the Kevlar and Dyneema mix fabric which stops your skin seeing the road in a slide. Hip & Knee armour pockets are stitched in to provide somewhere to put any armour of your choice adding even more protection. 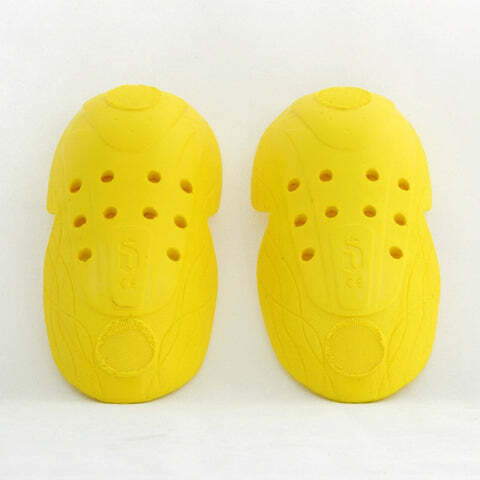 Armour inserts can be bought separately here. Just like every jean in the Draggin range, the Rebel is lined with the patented RooMoto technology liner that has been proven to provide 7.45 seconds of road abrasion. 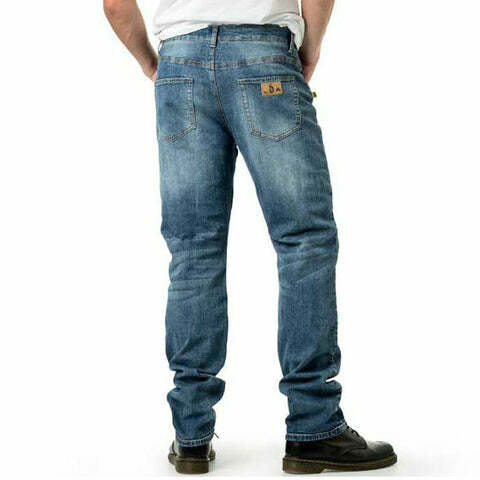 The Rebel jeans are ready for anything out on the road and are one of the most casual kevlar jeans on the market, not compromising on safety or style. Revz from Draggin represent the standard of protection that riders expect from Draggin but with the comfort of normal day to day jeans. The RooMoto lining keeps you safe in a slide whilst helping your skin to breathe, taking heat and sweat away from the skin. 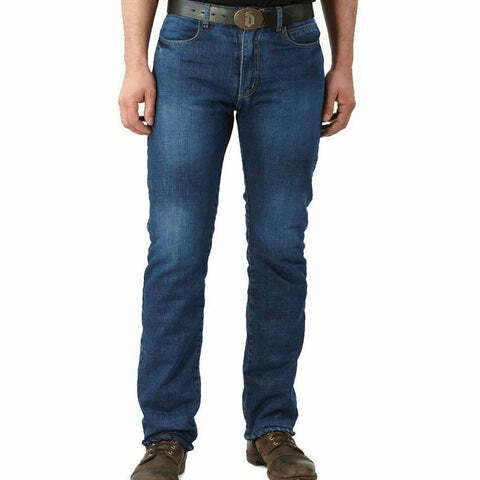 The stretch hems on the Revz make them easy to pull over your boots and stay there, while the silicone coating provides extra durability to the denim helping them stand up to heavy use for longer. 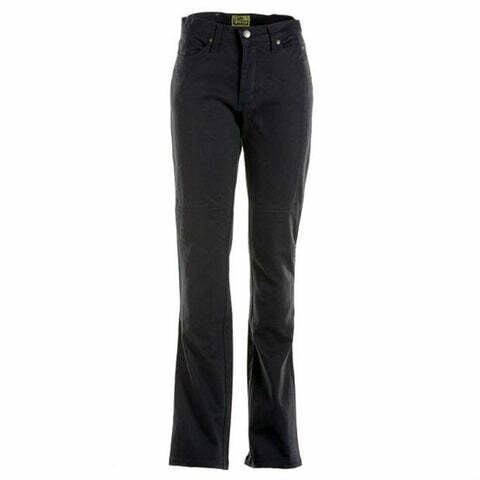 These Classic design semi boot cut jeans from Draggin are a stylish alternative to full riding gear for hotter days or when you need to park up and walk around town but want to do it in comfort. Featuring the Kevlar DuPont & Dyneema material that Draggin are well known for, inside of a stretch denim outer skin that hugs your legs but allows for easy movement while you ride. 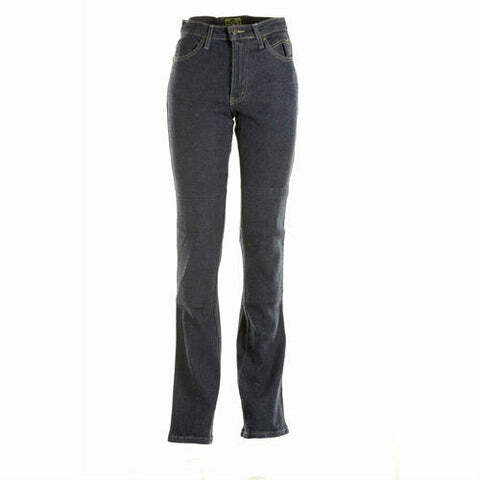 [lightbox url="https://cdn.shopify.com/s/files/1/0551/6185/files/draggin_jeans_womens_size_chart-min_1.png?15372475380672173135" text="View Draggin Jeans Ladies Size Chart" class="btn btn-info"